Their has never been anything quite like The Red Hot Chilli Pipers, from a cameo appearance at T in the Park in 2004 with the Darkness to opening the main stage in their own right in 2014. The past ten years has seen the Red Hot Chilli Pipers become the most famous bagpipe band on the planet..ever! Bagpipes with attitude, drums with a Scottish accent and a show that carries its own health warning. The Chillis have never been more in demand for their infectious style of feel good music which appeals right across the age range to people all over the world. They have collected together an impressive group of musicians from Scotland and further afield, many holding World Championship titles and all seriously good players with impressive credentials and qualifications. In 2014 The Chilli Pipers released a new live DVD and CD entitled `Live at the Lake`. 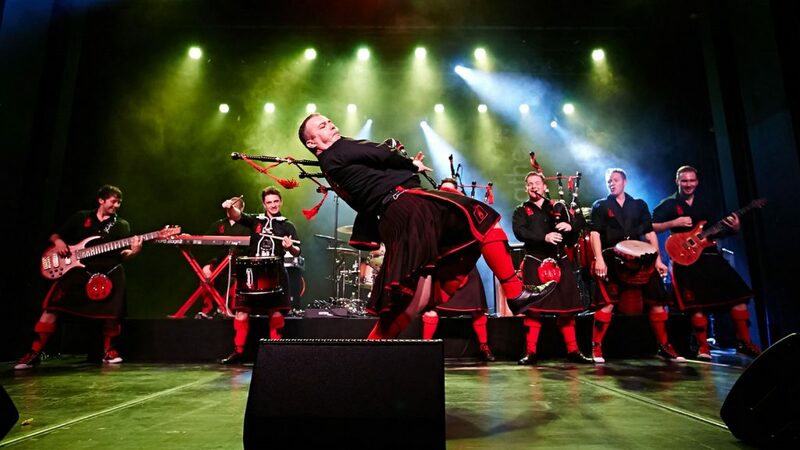 In an explosive evening of entertainment captured on this live DVD and CD, The Red Hot Chilli Pipers recorded their most adventurous project to date, bringing 16 musicians and dancers across the Atlantic to perform at Milwaukee Irish Fest, the US spiritual home of the band. They captured the unique and explosive power of the Chilli Pipers in one unforgettable evening by the shores of Lake Michigan. Tracks include .Insomnia, Gimme All Your Lovin’ , Thunderstruck, Everybody Dance Now, Amazing Grace, Fix You, Chasing Cars, Wake Me Up , Don’t Stop Believin and We Will Rock You. During the winter of 2015/2016 the Pipers recorded new tracks and are excited to announce the release of a new studio album – “Octane”. It represents a high energy, powerful, intense and hopefully inspiring album that we aspired to create. “Octane” is a continued fusion of traditional tunes and rock classics, taking bagrock to a whole new level which The Red Hot Chilli Pipers are proud to share with you!